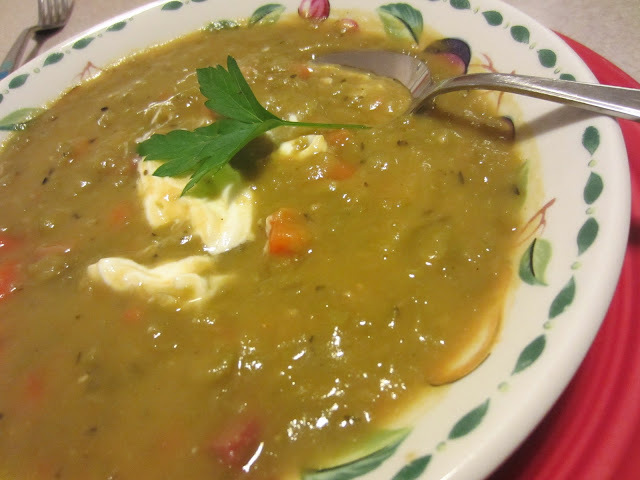 This was the first time I have ever tasted, let alone made Split Pea Soup...crazy...I know. Was it the color, the texture, the look of it that turned me off all these years?....or maybe it was the fact that I was a Labor and Delivery nurse for all those years...( if you are familiar with L&D nursing, you will know what I mean) ...IDK. I like peas just fine, and dried split peas are a great source of protein and fiber. For years now, my husband has been telling me Split Pea Soup is one if his favorite soups, next to Chicken Noodle that is...and I have just thought that Classic Ham and Bean Soup was close enough to satisfy him. 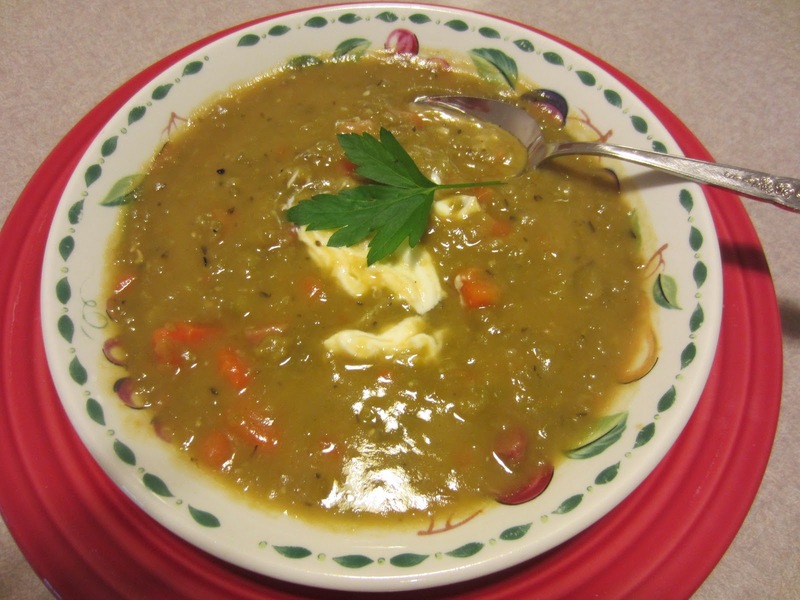 But for some reason, I have had split pea soup on my mind lately, and I keep coming across recipes for it. I made the soup. It smelled wonderful while it simmered and it tasted awesome. I decided I like split pea soup. You might too! (and for the record, even though it does have many of the same ingredients as the Ham and Bean Soup, it has a flavor all it's own.) One of the nice things about cooking with dried split peas as opposed to dried beans is that there is no "overnight soak." You can basically use the peas straight from the bag without any prep aside from rinsing them. They also cook up faster than dried beans. I came up with my own version of this soup after researching MANY recipes for it in various places. Apparently, getting really appetizing shots of Split Pea Soup requires photographic skills and/or a better camera than mine! lol It was still quite delicious though! 1. In a large 6 quart stock pot or dutch oven, heat 1 TBS olive oil on med-high heat. Add in onion and saute for about 5 minutes or until onion starts to become translucent. Add in garlic and stir. Cook until it becomes fragrant, about another minute or so. Add in celery, carrots, thyme and marjoram. Cook for another couple of minutes. 2. Add in rinsed peas, ham hock, chicken stock and water. Stir. Allow to come to boil, then reduce heat to simmer, loosely covered until peas are near tender, about 1 - 2 hours. It has been so darn rainy around here....we actually hit an all time record high for annual rainfall this week! Comfort foods....the slow cooking kind....have been on the forefront of my mind for sure! I wasn't sure the boys would go for this "green" food, but they both liked it a lot. My youngest son even had seconds! How about you? How do you feel about "green foods"? My picky daughter won't eat anything green...but my sons both have no problem with it. I have also been cranking out the soups lately, because I don't know if I have ever told you, but I do send food over weekly to my elderly in laws...and I know they like soup. Today is the last day to enter for a chance to win a $25 Bed, Bath and Beyond gift card to celebrate the one year anniversary of MKA. If you haven't entered, find out how HERE. Again, I want to say "thank you" to each and every one of you! Like this recipe?? Hop on over to FaveDiets October Blog hop and vote for it...if I get enough votes, I might win a Top Chef Cookbook that I would be willing to offer a chance for YOU to win on my blog! Sharing the love!!! What a sweet daughter in law you are to cook for your elderly in laws. They are so luck to have you cooking for them. I adore split pea soup! It's on the top of my list for soups. I have never purchased a smoked ham hock but have seen a couple different recipes calling for them lately. I have no idea how to calculate using it and then tossing. My mom wont eat anything soupy and green either! This is one of my favorite soups! I make a veg version and its cheap, healthy and delicious!!! I made this last night.....it is soooo good. Thank you so much!